Last month Burnaby, British Columbia, Canada was the host of the World Taekwondo Federation’s 2016 Junior Championship, which brought 800 young fighters, both male and female, from over 100 countries to compete over the course of five days. Some of us from the Vancouver Good Fight Team stopped in on the fourth day of the competition to take in the action and meet some of the young Taekwondoin and their coaches. Despite the diversity of countries represented, both the male and female divisions were dominated by South Korea, Iran, China, Russia and Turkey. While South Korea scored the highest number of medals in the male division, it was Iran which came out on top in the female division. Particularly deserving of mention is Mobina Nejad Katesari, who took home the gold in the girl’s -42kg division. Although it has not been confirmed yet, the 15 year-old from Gilan, Iran may have set a new world record: during the course of 5 bouts in 1 day, she scored 73 points and conceded not one. The origins of Taekwondo are inseparable from the turbulent history of Korea, particularly Japanese colonialism and the division of the peninsula into North and South in the aftermath of the Second World War. If Taekwondo can be said to have a founding father, it is Choi Hong Hi (1918-2002), also known as General Choi, who developed the fighting style drawing elements from both traditional Korean martials arts and Japanese karate. Born in what is today North Korea, Choi was conscripted into the Japanese army during the Second World War, was imprisoned and sentenced to death for his participation in an anti-Japanese rebellion, and become a second lieutenant in the South Korean army following liberation. He founded the International Taekwon-Do Federation (ITF) in 1966 with the goal of spreading the martial art worldwide, but soon fell out of favour with the South Korean government for his willingness to teach North Koreans. 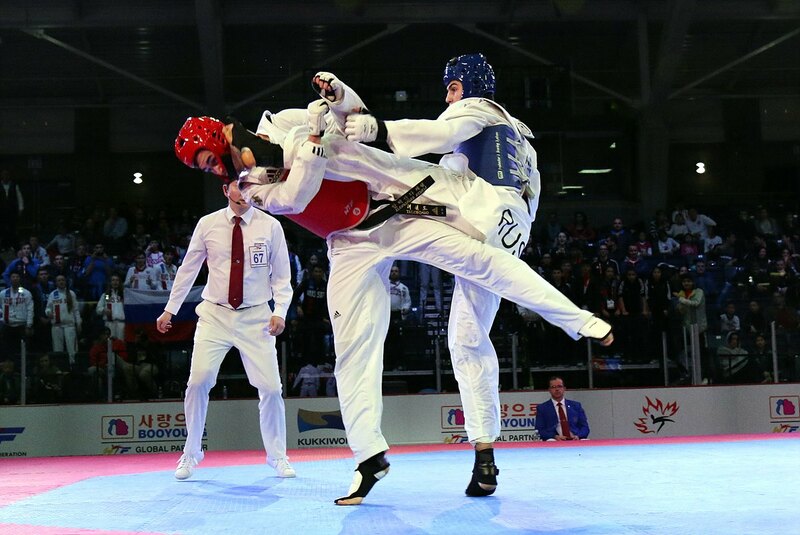 The World Taekwondo Federation (WTF) began as the South Korean government’s effort to rival the ITF, which was forced to move its base of operations to Toronto, Canada. Choi lived the remainder of his life in Toronto and North Korea. Taekwondo is often dismissed by outside observers as an impractical martial art, but nothing could be further from the truth. First of all, it isn’t just kicks, as some people seem to think. While WTF rules, which are also the basis of Olympic taekwondo competition, includes a point system which encourages kicks, any Taekwondoin worth his salt is more than capable of using his hands when he needs to. Secondly, while some Taekwondo kicks are very complex and not easily mastered, the art form also includes many simpler, more practical foot strikes that can be used in closed-quarters or street-fighting scenarios with devastating results, such as the Jump Front Kick and the Side Kick (see below). While many UFC-junkies are quick to scoff at such traditional martial arts, in fact many top MMA fighters come from a Taekwondo background, including none other than Anderson “The Spider” da Silva. Mixed martial artists, kick boxers and Muay Thai fighters who come out of Taekwondo are often distinguished by their ability to efficiently use kicks that require a level of flexibility and skill your average fighter doesn’t have.